Having a bit of a laugh, When the big news items about introducing the Beaver to Scotland at Knapdale first appeared, no one noted that we already had wild populations of beavers here already (maybe they did not want anyone to know?) At the time they were making their homes along the Tay reaching over 150 of them. They did try relocating some of these to Knapdate, don't know if they chose the wrong time of year but those transported died. Anyway folks, they have progressed up the Tay to here! They are busy felling trees on the river (which is one of the tributaries that feeds the Tay) that flows other side of the road from me. Think they have decided to use one of the small islands to build a dam, canal, and lodge. Actually I think they are just testing the water as they have only felled small trees skinny trees at the moment. Getting up close to those trees you can see just how amazingly sharp/chisel like their teeth are. Lots of mixed feeling among the locals. That is interesting because when there was news about the Knapdale project I felt sure I had heard about some beavers in Scotland. Just the other side of the road from you, eh? You know what we want to see on your next photo, don't you? Yes, photos! but you'll want to be careful about what tree you attach the trailcam to. No photos from me I am sorry to say as I now cannot walk very far, I can just about manage to walk around my patch. However, I get daily updates as to the goings on of the Beavers from my gardener who takes his dog for a walk along the river every evening. 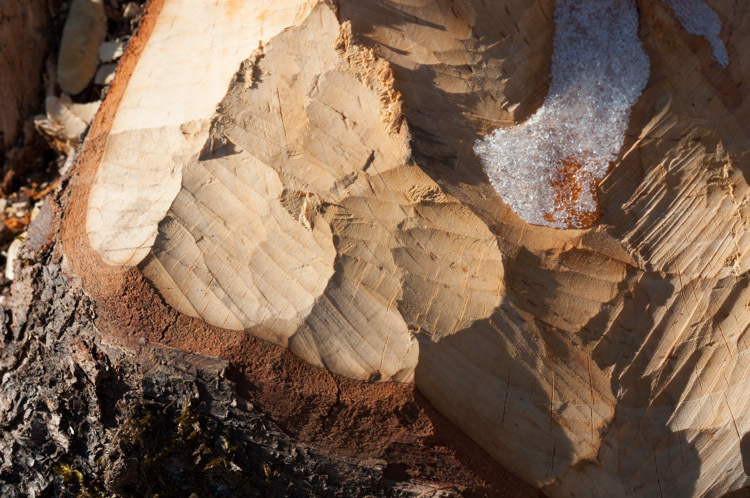 He bought me back a stump from a tree that had been felled by the Beavers, so I could see just how sharp and chisel like their teeth are. He tells me there are about 20 odd stumps, quite a few where people have sawn off the stumps and like him are intrigued. I have no doubt that some of the locals will be posting photos. Apparently there is already a couple of trail cams set up (probably by the reasearch centre, which is also on the other side of the road from me. That is an impressive bit of engineering. Good heavens, that looks like it was done with a wood-carving chisel. Having done some carving myself in the past, I am impressed! I find it amazing that all these pockets of beavers seem to have been kept secret, it is all the big news about them being reintroduced at the Knapdale project. I don't know about the Devon ones but they have been along the Tay for at least 10 years. Bet they are keeping quite about the ones that are being shot. 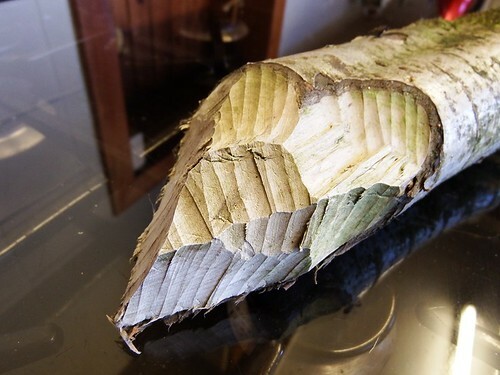 Sorry but that picture is not the work of a Beaver, that's been done with a Wood Carving gouge. 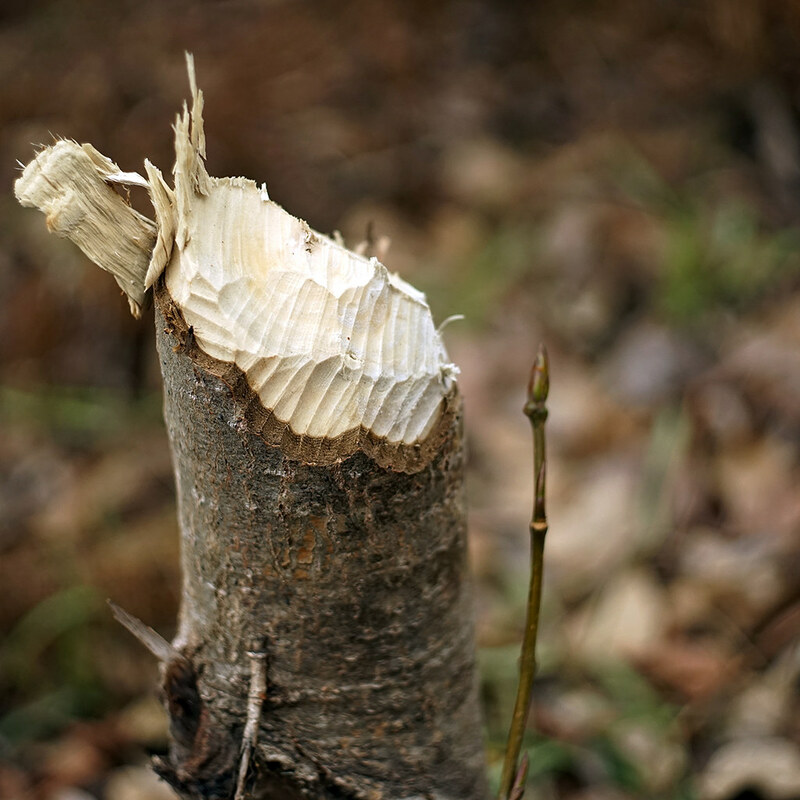 I have to agree with Deerhunter - that image is not typical of beaver damage. 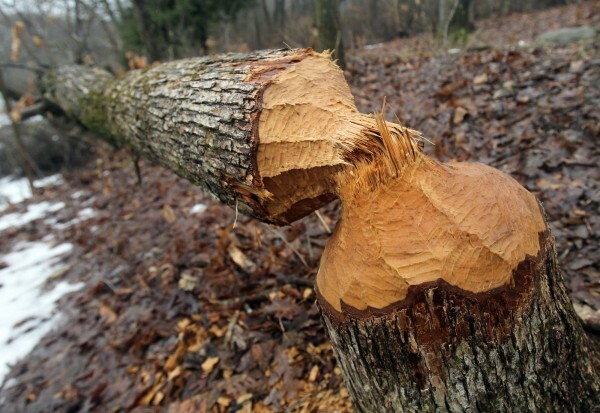 Do a google search for "beaver damage Canada" and you'll find some images of true beaver tree felling. I must also say beavers are not viewed as positively in Canada as they are here at the moment. I'm well acquainted with their views as I'm married to one. A Canadian that is - not a beaver! Sorry but it is Beaver. I know it looks like wood carving gouge I too used to do wood carving. But there have been a few witnesses to see these Beavers, and cutting the stumps that were left. Somehow I believe the witnesses, one of which was the River Warden. The tree are young Birch maybe the Beavers were 'chewing' the stumps after they felled the trees to get the sap that is rising in trees now. don't think they are that popular along the river where there is high numbers of them - been talk of farmers wanting them shot. I found these photos online... they seem to be very methodical in the way they go about it! The third photo is the best one. Well done! Last photo best with almost identical teeth marks to the photo I posted.